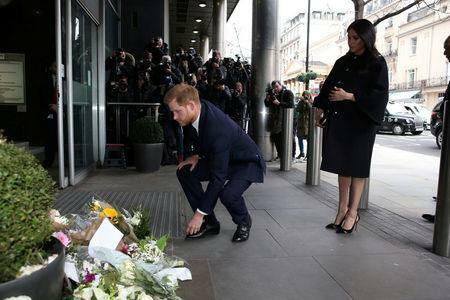 LONDON (Reuters) - Britain's Prince Harry and his wife Meghan paid their respects on Tuesday for the victims of last week's mass shooting at two mosques in Christchurch, New Zealand in which 50 people were killed. The couple visited the High Commission of New Zealand in London, where they signed a book of condolence on behalf of the British royal family. They also laid small bouquets of flowers outside the building, known as New Zealand House. Harry and Meghan, who married last May and are expecting their first child this spring, visited New Zealand late last year as part of their Pacific tour. Fifty people were killed and dozens injured when a gunman opened fire at two mosques in Christchurch during Friday prayers.